Reminder of Mercury transit across the Sun on Monday. The 2006 transit was captured in this composite of images from the SOHO satellite. If you’re reading this between the times of 11:12 and 18:42 UTC (7:12 a.m. to 2:42 p.m. Eastern U.S. time) on Monday, then the transit of Mercury is occurring right now. Get thee immediately to this page I wrote all about the transit to find out how to watch it live online, with your own equipment, or at a nearby astronomy club. 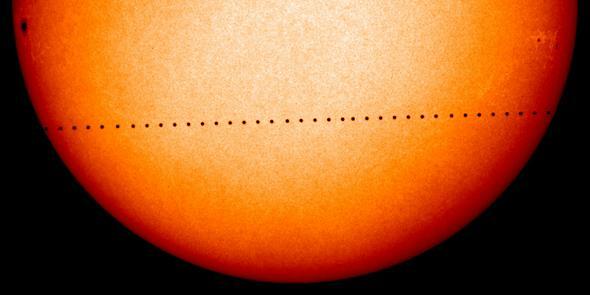 This transit—when Mercury crosses the visible face of the Sun—happens pretty rarely; the next one won’t be until November 2019. So if you can, take this chance to take a look. Remember: Never look at the Sun without proper protection! I have links to how to safely observe this on the other page. Go!